Let this in-depth guide prepare you for the latest CCNA examApproach the CCNA exam (640-802) with confidence through the detailed preparation you'll receive in this bestselling study guide from leading Cisco networking authority Todd Lammle. This new edition-updated to reflect the very latest changes in the CCNA exam-features expanded coverage of key topic areas plus new material on the latest switching techniques, network address translation, IPv6, and advanced OSPF. Reinforce your study with the author's supplemental video and audio instruction on CD. Inside, find the complete instruction you need, including:Full coverage of all exam objectives in a systematic approach, so you can be confident you're getting the instruction you need for the examPractical hands-on exercises and labs to reinforce critical skillsReal-world scenarios that put what you've learned in the context of actual job rolesChallenging review questions in each chapter to prepare you forexam dayExam Essentials, a key feature in each chapter that identifies critical areas you must become proficient in before taking the examA handy tear card that maps every official exam objective to the corresponding chapter in the book, so you can track your exam prep objective by objectiveLook inside for complete coverage of all exam objectives.SYBEX TEST ENGINE: Test your knowledge with advanced testing software. Includes all chapter review questions and bonus exams.ELECTRONIC FLASHCARDS: Reinforce your understanding with flashcards that can run on your PC, Pocket PC, or Palm handheld.VIDEO AND AUDIO INSTRUCTION: Author and popular trainer Todd Lammle provides almost an hour of additional video instruction, as well as thirty minutes of audio.Also on CD, you'll find the entire book in searchable and printable PDF. 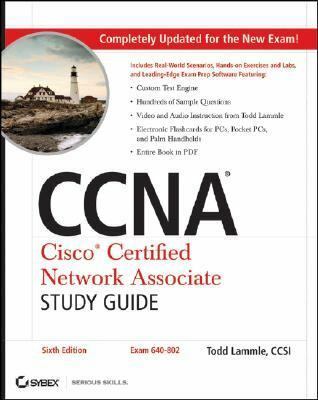 Study anywhere, any time, and approach the exam with confidence.Lammle, Todd is the author of 'Ccna:Cisco Certified Network Associate Study Guide Exam 640-801', published 2007 under ISBN 9780470110089 and ISBN 0470110082.